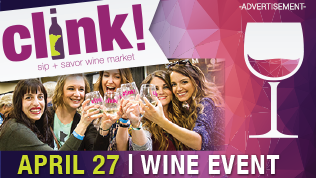 Minnesota Uncorked™ in conjunction with Minnesota Grown are calling on YOU to help bring more local wine into area restaurants! Visit Minnesota Grown to join the movement. Crisp beverages have a cleansing effect that makes them very food friendly. Wines from cooler climates ­— like Minnesota­ — are naturally crisp, due to their higher acidity. Wines from warmer growing regions tend to have lower acids, higher alcohols and stronger tannins, making them challenging to pair with foods. In addition, acid in the right proportion, provides balance and longevity to wine. 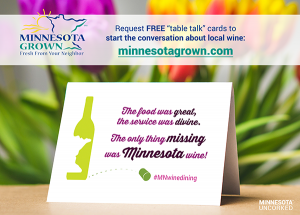 Minnesota wines are Minnesota grown! Minnesota Farm Wineries are required by statute to source at least 51% of their fruit from Minnesota growers, supporting thousands of acres of vineyards across the state, and hundreds of jobs. Minnesota wines truly are a boon to our local economy! What can a someone unfamiliar with local wine expect? “In general, Minnesota wines are a little more acidic than people are used to, akin to a wine from the northern part of Germany like a dry Riesling. But these days you’ll see a mix of sweet and dry styles thanks to the grapes developed by the University of Minnesota’s breeding program, and this is slowly creeping into the awareness of the local wine-drinking public.” says Aaron Berdofe, wine educator and Minnesota Grape Growers Association board member. 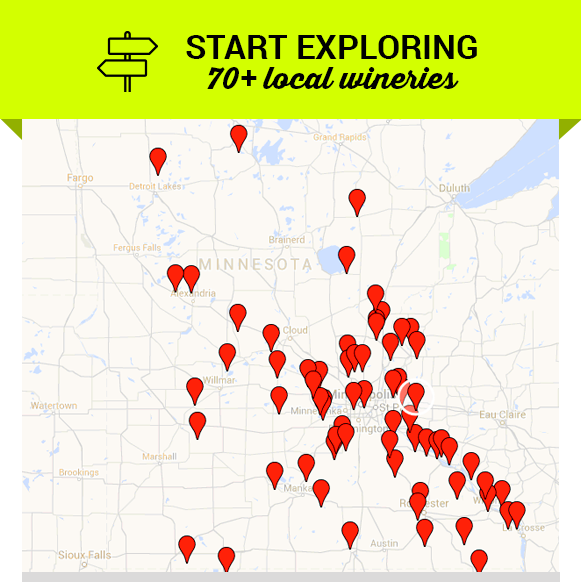 We're developing some quick guides to Minnesota wines to help you get to know (and sell) these wines to your customers. We'll let you know when they're ready if you drop your email here. We’re developing some “quick guides” to help you get to know these wines (and if you’re in the restaurant/wine biz, to describe them to your customers). We’ll let you know when the guides come out if you drop your email in the box above! Got a tip? Let us know & we’ll add it to our directory! Trouble viewing the map below? Check it out here instead. Use #mnwinedining to share your favorite pairings, restaurants, and photos of local wines in the glass or on the menu – we’ll be picking up & sharing these posts!